On Saturday we held the official launch of our new @Inflectra internship program. We hosted a meeting of the Silver Spring, MD freeCodeCamp meetup group in our building. We were lucky to have the help of a neighbor in the building – Catylator, a local makerspace - to provide a stimulating venue for the event. Over the classic technology combination of code, pizza and beer, we outlined our new program aimed at helping coders, testers and other aspiring technologists grow their skills and make them marketable. Our plan is to take 1-2 members from the local freeCodeCamp chapter each month and give them an internship at Inflectra, to work on real software problems, with real customers, working alongside our teams as peers. We will support each intern to scope a Capstone project for their placement, that will become a great addition to their portfolio. At the end of the internship, they get to showcase their code on sites such as Github, and Inflectra will write them a formal reference as well as formally introduce them to recruiters that we have partnered with. The goals are to provide a place where our interns can: try out a career in software development or testing before committing to making the career change; get an intensive boost to their skills and confidence, and gain the sort of real world experience tech recruiters are looking for. The program was the brainchild of one of our technical leaders – Simon – who is a member of the local freeCodeCamp group himself. Through the group he met Frederick who had been working as an IT sys admin at a large Government contractor. Frederick was looking to make a career change into coding but didn’t know where to start. Frederick interned with us for two months, helping build a plugin for Atlassian Jira that integrates SpiraTeam testing data into Jira. He also joined various team meetings for SpiraTeam and KronoDesk, seeing daily life in a software company from the inside. At the end of his internship, Frederick was lucky enough to quickly get close to a dozen interviews and is now working (very happily) as a full time software development professional in a local software company in the Washington, DC area. 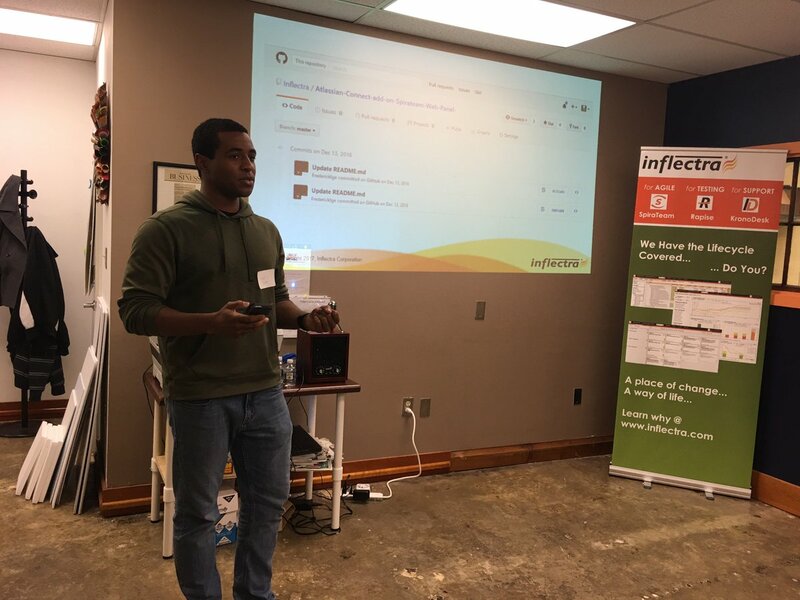 During the event we outlined the internship program, gave some information on Inflectra and our mission, and Frederick described his experiences. The crowd attending was incredibly diverse, including current students from The University of Maryland, people working in other fields (pet care, working in a music shop), and people looking to get back into the workforce. As diverse as the group was, their response was pretty much uniform: excited about the program, interested in what technologies we’d recommend they learn, and wondering when they could start. Seeing such enthusiasm and passion from so many people looking to learn, grow, and change their lives was amazing. It made us even more impatient to launch our internship program. If you are interested in the internships, contact us and we'll put you in touch with the program coordinator.